Simple enough to complement any decor, with enough Old World beauty to make a statement in any room of the home, our handcrafted Modern Mission Mirror offers versatility when it comes to redecorating a room. Crafted by hand from solid hardwood, this mirror is made for a lifetime of beautiful reflections - and providing a keepsake that can be handed down and enjoyed for generations to follow. At the center, a beveled edge mirror provides a beautiful reflection - offering a place to swing by and make sure you're looking great. 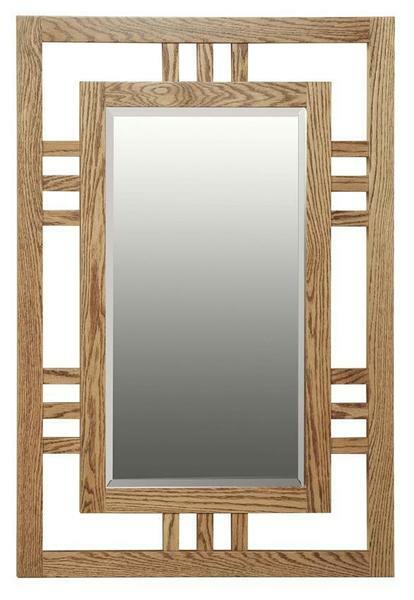 Holding this mirror if a solid hardwood frame, fixed to a larger frame and connected with a familiar Mission slat design - focusing mainly on utility, while allowing the simple, clean lines of the flat from to highlight the beautiful, natural grain patterns in the hardwood. Customize a Modern Mission Mirror to match or complement any decor you choose - by selecting from four different hardwood and stain combinations, to get just the right tones for your space. And, while we strive to offer products that work for most situations, we understand that your needs may be different. If you needed tailored dimensions or a different stain option, please call one of our Furniture Specialists today to request a free custom quote, request stain samples, and start your order by phone. 30" x 0.75" x 44"